Enemy starfighters are on your tail! 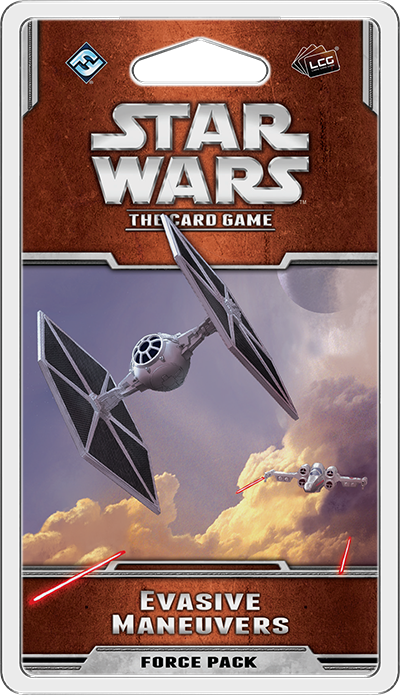 Prepare to take immediate action with Evasive Maneuvers, a new Force Pack for Star Wars™: The Card Game, now available at your local retailer and online through our webstore. 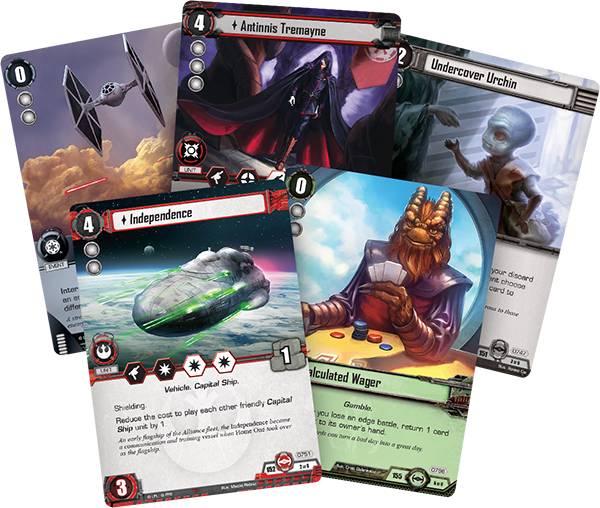 This Force Pack continues the major themes of the Rogue Squadron cycle by introducing new starships and their pilots. You’ll fly patrols with the Empire’s TIE fighters and command massive fleets of Rebel capital ships. But this expansion also challenges you to take evasive maneuvers when your feet are firmly on the ground. You can lurk in the darkness of Prakith with dark side Force users, hire the services of a deadly Anzati assassin, or hide in the shadows of Nar Shaddaa with an ancient Jedi recluse! The Jedi have survived the aftermath of Order 66 only by remaining hidden throughout the galaxy. The Empire possesses massive resources and armies, but even these forces are not limitless. You can trick the dark side into ignoring your efforts with the new Jedi objective set introduced in Evasive Maneuvers. 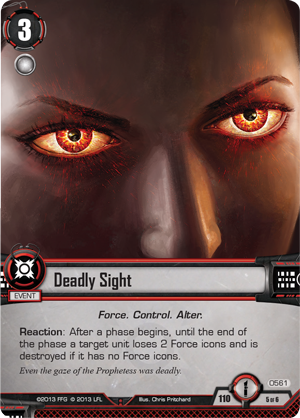 This set begins with Hidden from the Empire (Evasive Maneuvers, 745), an objective with a truly game-changing effect. 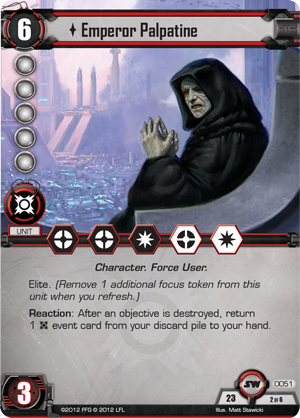 While Hidden from the Empire is undamaged, a player cannot play units while he controls more units than each opponent. When played correctly, this restriction can choke your opponent’s flow of units to a standstill. 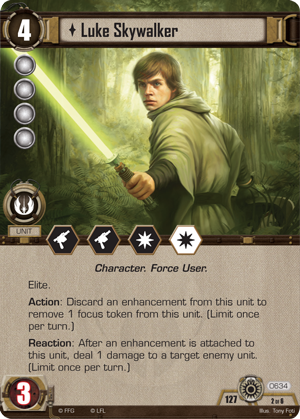 For example, on the first turn of a game, the light side commonly has no units in play. 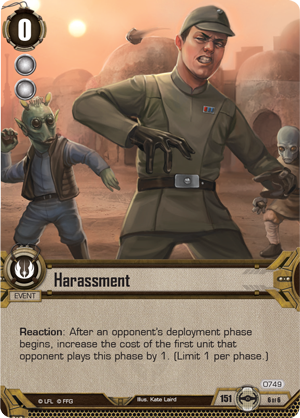 In this situation, the dark side player can only play a single unit during his deployment! 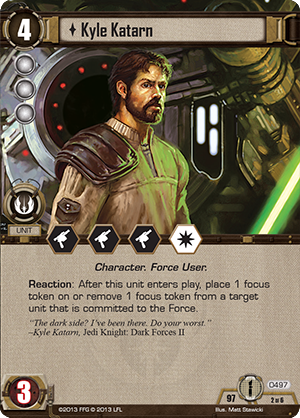 Of course, the objective’s text affects both players, but the main units of the Jedi affiliation, such as Luke Skywalker (Core Set, 92), Yoda (Join Us or Die, 568) or Kyle Katarn (Heroes and Legends, 497) are some of the strongest units in the game. Hidden from the Empire keeps your opponent from overwhelming your heavy-hitters with a swarm of lesser units. 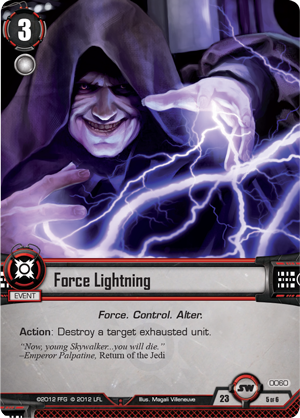 If you’re going to be focusing on a few powerful units, you’ll want to ensure that they can’t be picked off by tricks like Force Lightning (Core Set, 60) or Deadly Sight (Knowledge and Defense, 561). 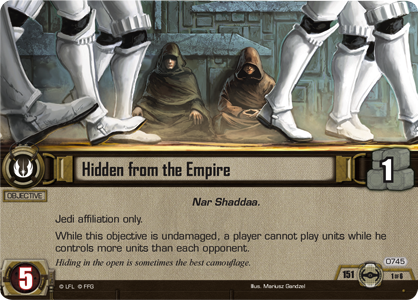 To this end, this objective set includes two copies of Hidden in the Shadows (Evasive Maneuvers, 748). 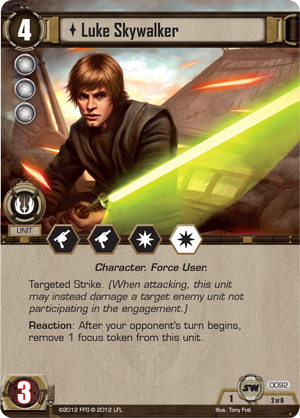 This enhancement prevents the enhanced unit from being targeted by enemy events, and you can deal extra damage to your opponent’s units by combining these enhancements with the newest version of Luke Skywalker (Between the Shadows, 634). 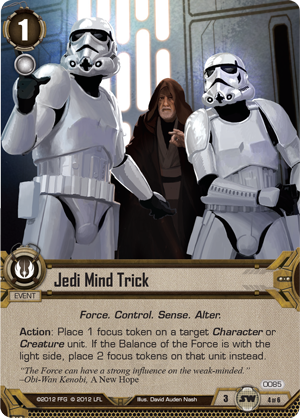 Of course, you can’t expect your main units to survive indefinitely, and useful events like Jedi Mind Trick (Core Set, 65) are discarded after use. But you can find both units and other tricks again with the help of an Undercover Urchin (Evasive Maneuvers, 747). Whenever you have two or more cards in your discard pile, you can focus Undercover Urchin to have your opponent choose a card in your discard pile to return to your hand! 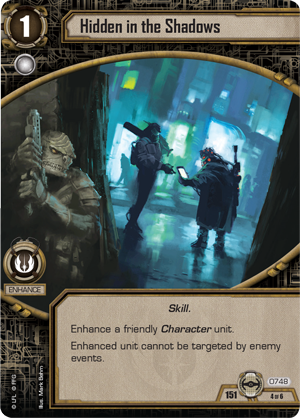 While Hidden from the Empire is in play, you generally won’t want to play the Undercover Urchin, since this would allow your opponent to play another powerful unit. But whenever you don’t have Hidden from the Empire in play, the Undercover Urchin can prove quite useful. 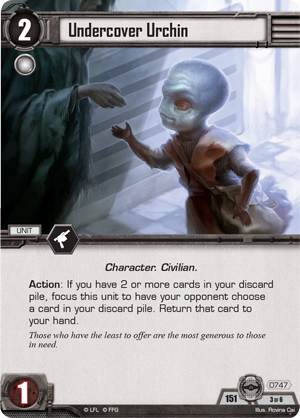 Added to the recursion already available to the Jedi in Obi-Wan Kenobi (Balance of the Force, 417), the Undercover Urchin turns your discard pile into an asset. 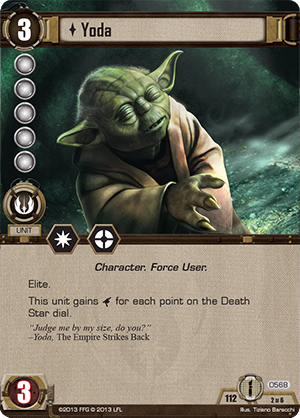 The Hidden from the Empire objective supports a play style that focuses on a few, powerful units, and it’s only natural to suspect that your opponent will attempt to play around this by bringing out his own high-cost, powerful units. When he does, you can respond with Harassment (Evasive Maneuvers, 749). You can play this free event after an opponent’s deployment phase begins to increase the cost of the first unit that he plays this phase by one. 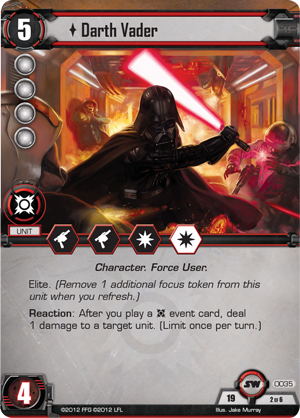 An increase of a single resource may not seem too significant, but it could easily prevent your opponent from playing a card like Darth Vader (Core Set, 35) or Emperor Palpatine (Core Set, 51) until the next turn, buying you valuable time. 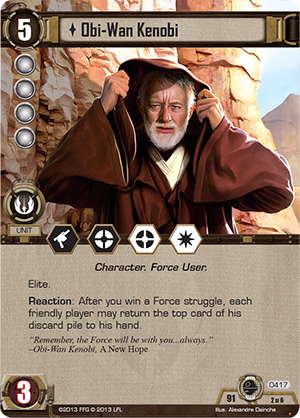 You can punish your opponent for playing his most powerful units even more by using the final card in this objective set: Vima-Da-Boda (Evasive Maneuvers, 746). This Force User spent much of her life hiding on Nar Shaddaa, but that doesn’t mean she’ll ignore a powerful threat. 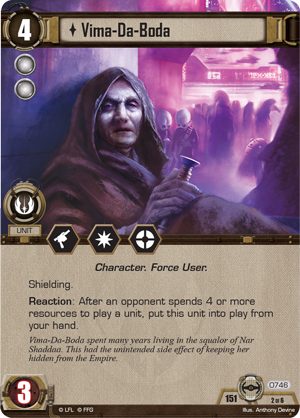 After your opponent spends four or more resources to play a unit, you can put Vima-Da-Boda into play from your hand. With shielding and a normal version of each combat icon, Vima-Da-Boda can help accomplish any task you set before her. Your enemy is never weaker than when he believes he is completely in control. Surprise your opponent with some Evasive Maneuvers. Pick up your copy of this Force Pack from your local retailer today!